The Rediwa C.A.T 3 hidden clip to cover ventilated facades is a concealed and longitudinal chemical mechanical fastening system. The concealed mechanical fastening device is made from stainless steel clip screwed to the vertical structure. The ceramic is held in position by these steel clips as their flanges are inserted in the grooves made previously on the ceramic borders. These grooves are made with an industrial machine under the highest levels of safety control, to guarantee that both the depth and width of the grooves are in keeping with standards. 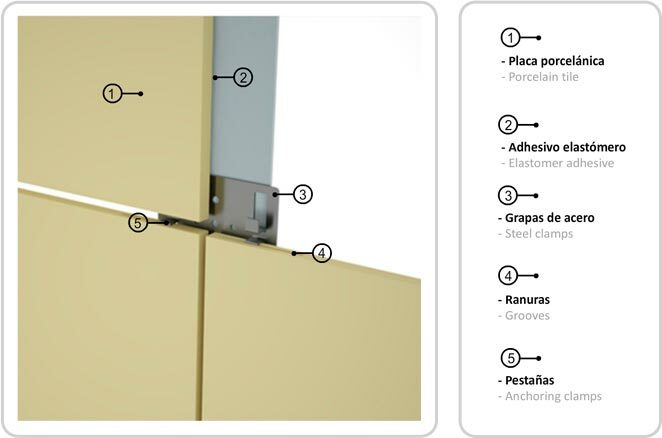 On the critical surface between the rib of the ceramic tile and the vertical sub-structure, in a longitudinal shape, there is a MS-type elastic adhesive chord, which provides the system with a chemical longitudinal fastening. Furthermore, the use of this elastic adhesive allows the movements of the ceramic coating caused by the wind to be absorbed (“plate movements” or vibrations of the ceramic tiles are eliminated) and that is why the tile is not directly in contact with the structure, so the adhesive absorbs the various dilatations between the different materials. Furthermore, this ceramic longitudinal fastening of the structure means that, in the event of an accidental break to a stoneware tile due to an impact of one kind or another, most of the ceramic will remain stuck to the substructure without becoming detached.